Back Connected (Angle Form) thermometers are ideal for local, eye-level temperature readings in most process applications. Adjustable Angle (All-Angle) thermometers allows for easy temperature monitoring from any position. 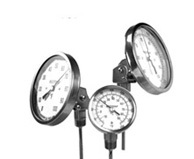 Bottom Connected (Straight Form) thermometers are ideal for side and elevated installations on tops or sides of tanks or pipes. Silicone-Filled Thermometers are offered for severe industrial applications where vibration is a problem. Silicone dampening prolongs instrument life by preventing wear and fatigue in the instrument’s internal parts. Dual-Mode Thermometer (Model DMT) is a convenient, multipurpose indicator for local and remote temperature monitoring. This dual-sensor system puts two sensors in one thermowell and allows easy tie-in to process control.